Down in the forest . . . creak, snap, BUMP! A pinecone falls to the ground. Good Wolf is thrilled with his new toy . . . until Bad Bird steals it from him. But there’s a twist in this tale: with a bit of quick thinking, Wolf not only nabs his pinecone back – he gets a tasty Bad-Bird snack as well! 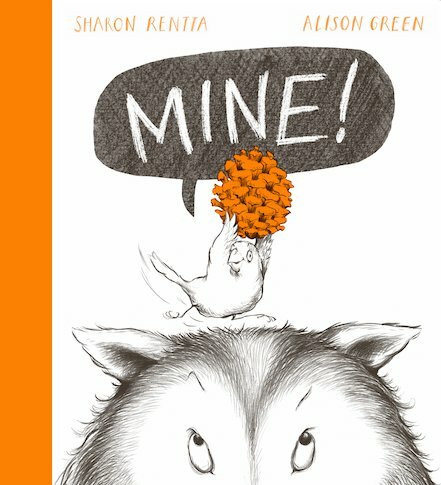 Much-loved illustrator Sharon Rentta has developed a dramatic and eye-catching new style for her latest picture book. Featuring superb black-and-white pencil drawings with dramatic spot colour, MINE! is a wickedly funny, Tom-and-Jerry-style caper.